Meadows, fields, suburbs, and other open areas. 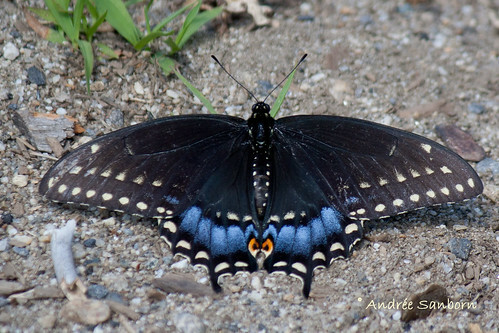 Black swallowtail is a mimic of the unpalatable pipevine swallowtail (Battus philenor). It has a wingspan of 3¼″ to 4¼″. Females are larger than males. The upper side of the forewing is black with two rows of yellow spots, one on the submarginal band, one on the median band. Both rows of spots extend to the forward (costal) margin of the wing. There is also a narrow, interrupted, yellow border on the outer margin, and a single yellow spot in the area just below the tip (subapical area). On the male, the medial spots are large and closely spaced. On the female they are narrow and widely spaced. The upper side of the hindwing is black with a marginal row of yellow spots, a postmedial row of iridescent blue spots, a median row of yellow spots, and a narrow, interrupted, yellow border on the outer margin. There is also a single eye-spot on the trailing margin near the tail. The eyespot is orange with a black pupil and a yellow border. On the male, the blue postmedial spots are small, and the yellow medial spots are large and closely spaced. On the female the blue postmedial spots are large, and the yellow medial spots are narrow and widely spaced. The hindwings have “tails”. The underside of the forewing is black with yellow markings mirroring those on the upper side. The underside of the hindwing is black with markings mirroring those on the upper side except that many of the yellow spots are partially or completely replaced with orange spots. The caterpillar is variable in color and up to 2″ long. It appears smooth but is actually densely covered with minute hairs. The background color is usually green but may be white, yellow, brown and white, or black (see Comments below). The thorax is swollen and the head is held beneath the thorax. The thorax of the green form caterpillar is green with 2 black stripes in an inverted “V” pattern and 3 black spots. Each abdominal segment is green with a broad, horizontal black band. In each black band there are 6 yellow spots. There is also a narrow black band in the fold between abdominal segments. The legs are greenish-white with 2 black spots. There is a Y-shaped gland (osmeterium) in the middle of the upper (dorsal) portion of the first abdominal segment of the caterpillar. Normally, the osmeterium is held internally and is not visible. It secretes a chemical that produces a foul odor and repels predators. The secreted chemical may also be toxic to predators. When disturbed, the caterpillar will extend (evert) the gland, turning it inside-out, and attempt to smear the predator with the chemical. Mature caterpillars are found from June onward. The pupa may be green or brown. The color varies between individuals of a local population, achieving a balance that ensures maximum survival. 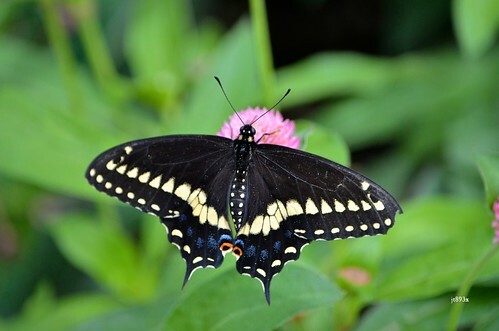 Eastern tiger swallowtail (Papilio glaucus) has a black form female that looks similar. However, it has only one row of yellow spots on the upper side of the forewing and there is no yellow subapical spot. Queen Anne’s lace, wild parsnip, spotted water hemlock, bland sweet cicely, American cow parsnip, and other members of the Apiaceae (carrot) family. Mating usually takes place on a hilltop. The female lays small yellow eggs singly on a leaf or flower of a host plant. She will lay 30 to 50 eggs per day, eventually laying 200 to 440 eggs. The larva hatches 4 to 9 days later. Over the next 10 to 30 days it molts 4 times before pupating. It overwinters as a chrysalis. The background color of the caterpillar is usually green but may be white, yellow, brown and white, or black. The color is determined by the wavelength of light reaching the pupae when it is in the first instar stage. This color polymorphism allows the caterpillar to match the background color of the host site. This is the state butterfly of Oklahoma. The pupa (third) stage of a butterfly or moth during which the caterpillar metamorphoses into an adult. In moths, the pupa is enclosed in a silk cocoon. In butterflies, the pupa is naked but protected by a hardened outer shell. In insects, the region just before the tip of the wing. This shows the different stages of a Black Swallowtail from caterpillar to Butterfly and all points in between. 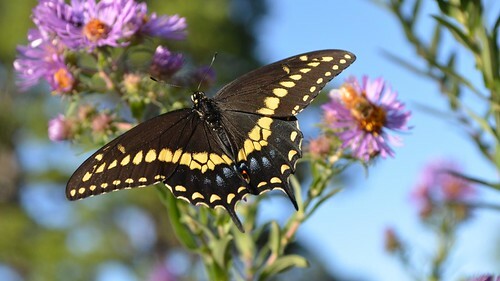 The black swallowtail mimics the bad tasting pipevine swallowtail, Battus philenor (Linnaeus), which is all metallic black-blue on the upper surface of the wings, lacking the yellow and blue markings. Caterpillars feed on pipevines, Dutchman's-pipe and Virginia snakeroot. Habitat and Food Source(s): Caterpillars have chewing mouthparts. Adults have siphoning mouths. Host plants of the caterpillar include members of the parsley family (Umbelliferae) including carrot, parsley, dill, fennel and Queen Anne's lace and some members of the Rutaceae (Ruta graveolens and Thamnosma texana). This caterpillar is bad tasting to birds and other predators because of toxins absorbed from the host plants. Like other larvae of swallowtail butterflies, parselyworms have a defensive structure, called an osmeterium, right behind the head. This structure is usually concealed. However, when disturbed this "Y" or "V" shaped organ is inverted. It emits a strong odor that is apparently distasteful to predators. 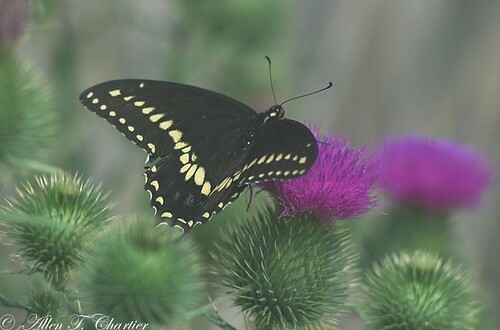 This butterfly is easy to attract and raise by planting dill or fennel in your vegetable garden. I spotted this fellow on my second year parsley which was going to seed. I've enjoyed seeing these caterpillars since i was a kid. They chow down on dill/parsley. This was the first opportunity i have had to see one turn in to a chrysalis.